The Walkway Over the Hudson State Historic Park in Poughkeepsie is the world’s longest linear park and was once a 19th century railroad bridge. The park brings 500,000 visitors each year through Walkway Over the Hudson nonprofit group that implements innovative community programs and events. Walkway Over the Hudson State Historic Park opened in October of 2009 and consists of a pedestrian bridge that connects the cities of Poughkeepsie and the Town of Lloyd over the Hudson River. The history of the bridge dates back to 1871 when it was chartered as a railroad bridge in Poughkeepsie. The the bridge’s first cornerstone was laid in 1873 and it was opened in December of 1888. When trains started operating on the line in 1889, the bridge was the longest in the world. The bridge was used extensively in World War II and was damaged by fire in 1974. The fire ended the use of the bridge after almost one century. Walkway Over the Hudson, a nonprofit group, began efforts to open the bridge to the public in 1992 and started the hard work to link the rail trails on both sides of the river. 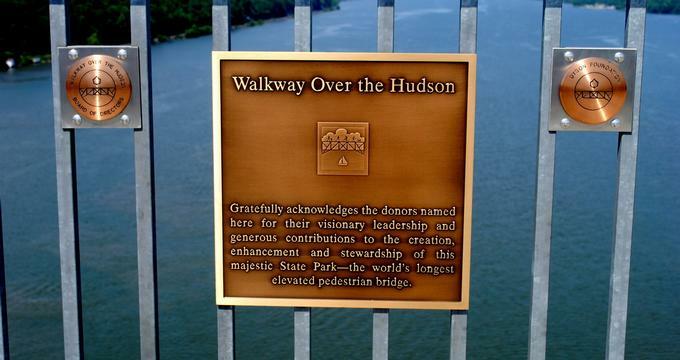 Six years later, Walkway Over the Hudson finally gained ownership of the bridge and in 2007 was able to partner with Dyson Foundation to secure funding to transform the bridge into a public park for pedestrians. The park opens daily at 6:30am and closes at sunset. During special member events, the park may stay open later or open early. Hours may also change seasonally and for private or fundraising event. Approximately opening and closing times by month are listed on the website. There is an elevator that operates from 9:00am until 1 hour before park closing time during good weather. Walkway State Park is all about the “360 degrees of Discovery” and visitors have an opportunity available to them in every direction from the center of the bridge. Each of the host communities that serve as the anchors for the bridge—Town of Lloyd and Poughkeepsie have specific points of interest called discovery zones. At the center of the bridge is a map that provides an overview of each zone with approximate distances to each from both gates. There are 9 zones total. · Highland Hamlet- A old time downtown atmosphere full of boutique shops and restaurants along the Hudson River Valley High Lands. · Highland Landing- 250 years ago this was where ships arrived with reinforcements for the battle of Saratoga. The home of Anthony Yelverton is the oldest wooden structure still standing in Ulster County. Bob Shepard Highland Landing Park has a boat launch and dock with access to the River for boating and fishing. Vestiges of the Revolutionary War remain in this area and cannonballs can still be uncovered on banks of the river. · Franny Reese State Park- Purchased by Scenic Hudson, an environmental activism group in 2003, this 250-acre state park has 2.5 miles of trails and features the Cedar Glen Estate. Once used as a dairy farm, most of the land has been reclaimed by nature. · Illinois Mountain/Berean State Park- The highest point in the region where homesteaders in the early 19th century passed through the Mid Hudson Valley was known as Illinois Mountain because Illinois was the intended destination of the migrating settlers. The mountain is park of Berean State Park and visitors can fish, hike, mountain bike, or snowshoe here. · City of Downtown- Poughkeepsie was New York’s second Capital after the Revolutionary War and the downtown area is full of government landmarks and economic prosperity. Downtown has been the site of many political debates dating back to the ratification of the US Constitution in 1788 through the New Deal construction of Franklin Roosevelt in 1937. · Poughkeepsie Waterfront- Visitors to the waterfront can see a sculpture in Waryas Park that pays homage to Poughkeepsie’s economic establishment on the riverfront and early Dutch and British merchant settlers that first founded Poughkeepsie 100 years before the Declaration of Independence was signed. Collegiate rowing competitions have been held on the waterfront in the past, and the river is still used for economical pursuits. · Little Italy- The first residents in the neighborhood known as Little Italy were actually Irish who came in the 1840’s to escape the potato famine. The Italians arrived in the later 1800’s to construct the great railway bridge and built the churches, schools, and a daycare center for the immigrant children as well. The neighborhood has stuck true to these Italian roots and is still full of authentic Italian restaurants, festivals, and many Italian families still live in the neighborhood. · Union Street Historic Neighborhood- Poughkeepsie’s oldest neighborhood, this area of town began as a footpath that led to the store from the hilltop settlement. The path officially became Union Store Road in 1767 and houses started to be built alongside it. In 1971, 8 blocks of Union Street were listed on the National Register of Historic Places were stopped the neighborhood from being bulldozed. This historic neighborhood is a place for the arts, activism, and local business with residential neighbors today. · Southside Historic District- This neighborhood is comprised of 4 distinct districts that showcase the mansions of the elite in Poughkeepsie. Homes of famous inventors, industrialists, and civic leaders who called this neighborhood home a century ago can be seen in the Southside Historic District. From April 1st to October 31st guided tours are offered from 7am to sunset by appointment of Walkway Over the Hudson State Historic Park. Tours are an hour long and can be customized to focus on visitor’s favorite parts of the park or those they are most interested in learning more about. Each tour is led by a trained Walkway Ambassador. These ambassadors are knowledgeable in areas of the bridge’s history, construction, the Hudson River, history of the surrounding area, and the mission of the nonprofit. Tours are charged per bus, not per person and must be booked two month in advance to ensure availability. There is a mobile web tour available in English, Spanish, Italian, and Mandarin Chinese. These are great for those interested in a self-guided tour that can be taken at your own pace or if you are taking a walking tour of the park. These mobile web tours can be downloaded from any smart device and will take visitors through the history of the bridge’s construction, rehabilitation and transformation into a park, and the Hudson valley natural environment. There is also plenty of information available on other points of interest and other nearby historic attractions and Revolutionary War sites. Walkway merchandise is available for sale on Saturdays, Sundays and select holidays at the Welcome Booth at the entrance of the bridge. The open hours depend on weather and number of volunteer staff. Sales from merchandise purchased help support walkway programs and maintenance of Walkway State Park. EmbroidMe creates all of the Walkway merchandise and can ship merchandise from online sales as well. Some merchandise is seasonal, but an assortment is available online such as T-shirts, hats, and accessories. De’s Jewelers offers a Walkway Hudson bead that fits on most bead bracelets. For every bead sold, De’s donates $5 to Walkway Over the Hudson. Walkway Over the Hudson is a nonprofit that hosts fundraising events annually to help support park programs and improvements. There are three major fundraisers. The Walkway Ambassador Volunteers are part of the Walkway Over the Hudson nonprofit organization and are always in need of more hands to assist in the visitor experience at Walkway State Historic Park. Volunteers provide on-site information, serve as docents, give tours, support fundraising and special events, donate their time, skills and services to maintain the park, and support the visitors at the park. Training classes are offered seasonally and is comprised of two classes that are each two hour long and an onsite tour. Each volunteer is required to volunteer at least 50 hours per year. If you are unable to physically volunteer but would still like to support the park, you can consider becoming a member. Walkway Over the Hudson Membership cards can be obtained through the Poughkeepsie Library and come with perks such as invitations to exclusions members only events, discounts on merchandise, benefits with park partners, and more. You can also join online or through the welcome center, through the mail, or by phone. Memberships are also tax deductible.